When some unknown people misled a mob charged with post-Burhan sentiment and axed the vast high-density apple orchard in Bamdoora, it was seen as the end of Kashmir’s dream apple. 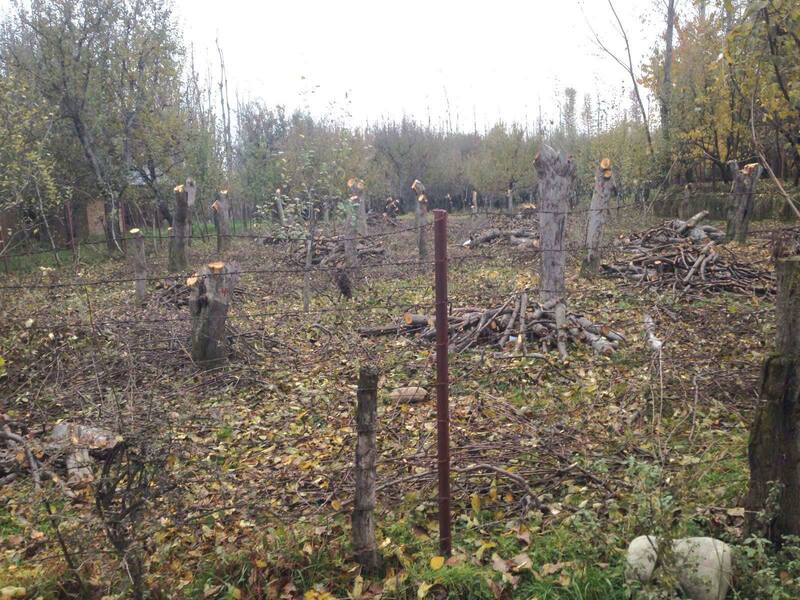 The orchard located in the same village where the teenage rebel was killed in an encounter was axed twice. People behind the attack wanted to be doubly sure that the initiative decimates well before it emerges as a model. Half a year later, the orchard still retains looks of a devastating massacre. Police, as usual, are investigating the case. Nobody has touched even a single branch. But the government has decided to go ahead and take a different route to realize the big dreams. With Rs 150 crore already set aside for replanting the antiquated orchards, some as old as 80 years, with high-yielding, high-density imported root stock, a scheme is being formally launched, this week. In the first year, the government is targeting replanting at least 50 hectors. That may not involve a lot of money – may be around Rs 20 crore, but it will mark the arrival of high-density at ground zero. To achieve this target, the new scheme involving farmers, banks and the private sector in such a way that it will mark the beginning of professional entry in the market. Almost 67 percent of the costs are expected to be borne by the government. Banks will offer two-third of the balance requirement at 9.9 percent with five years moratorium against hypothecation of the asset created. Interestingly, the high-density rootstock starts bearing fruit by third year only. High Density has three key elements: the root-stock, the steel trellis that supports the plants and shares their fruit burden and the drip irrigation set-up. The scheme envisages subsidising the plant material by ninety percent and the balance two ingredients by fifty percent which eventually will make overall 67 percent of the project. The scheme is not applicable for orchards if they measure less than five kanals of land or more than a hector. For the sake of transparency and proper implementation of the scheme, farmers not availing the loan part will still have to move through banks. This, policy makers say, will improve transparency and audit. 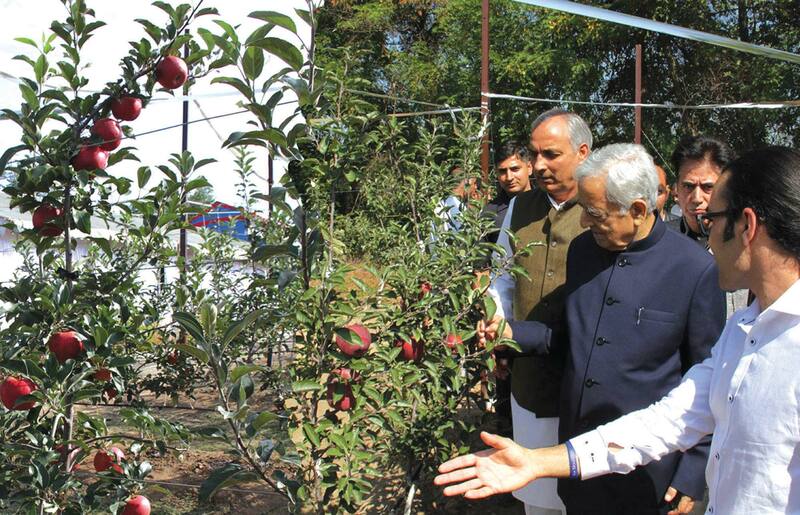 Government sources said J&K Bank has cleared special product for the particular scheme aimed at starting a process that will eventually cover the entire 150,000 hectors of orchards across Kashmir. If successful, the project will push the apple economy from the current Rs 5000 crore yearly turnover to the next level with Rs 50,000 crore sector as yield will improve, many times, if managed professionally. Unlike all the traditional system of implementing subsidized schemes, the concession element in this one will be available up-front, from the very first day. Farmers will not require going to government offices for subsidy as it will automatically credit to their accounts once the basics are over. Implementation of the scheme involves four players at different levels with farmer being the principle one and the ultimate beneficiary of the entire process. Government will fund the scheme and act as regulator as the bank will be the financial controller. An orchard development company will work on orchard with mixed kitty of farmer’s contribution, government subsidy and bank’s dept. It will have deadlines to keep and guarantees to maintain to escape blacklisting. It will be the orchard developer who will deliver the high density orchard to the farmer. Till the processes of professional management become common, the scheme is expected to remain unchanged. The final half of the costs would be released to the developer only after the bank, government and the farmer issues a certificate. Part of the subsidy will be released by the bank at the start for the necessary spadework. The scheme will not fund the fencing of the orchard or creation of water source feeding the drip irrigation set up, that will have to be borne by the farmer. The government had actually launched a scheme last year when it imported 120 plants. It also had an ingredient of 90 percent subsidy on plant material but it suggested farmers to manage the drip irrigation and the trellis structure at their own. Though these plants are still at the horticulture departments nurseries in Zainapora, this is expected to cover almost 40 hectors of orchards. However, an internal audit has led to the identification of flaws that were reportedly taken care of in the upgraded scheme, High Density Apple Plantation Scheme that Chief Minister Ms Mehbooba Mufti launched on Saturday. Under the new scheme the plants per hector has increased from 2222 to 3333 and the farmer was kept out of the implementation process beyond his consent, land and twenty percent of the costs. Planting a kanal of orchard will cost anywhere between Rs 1.75 lakh to Rs 2.24 lakh which is directly linked to the quality of soil and the accessibility of the spot. Both the schemes will operate simultaneously. The earlier scheme requires an overall investment of Rs 35.15 lakh (including debt portion of Rs 12.75 lakh) per hector against the newer one that will take Rs 44.81 lakh (Rs 16.25 lakh debt) for 3333 plants per hector. For the obvious lack of professional nurseries, the plant material is expected to come from Europe, mostly from Italy and Netherlands. J&K will take some time to learn the art of creating nurseries that can grow M-9 root stock. All the important rootstock need to have samples in a quarantined facility where they will undergo various tests for almost a year. This is despite the fact that the suppliers will offer buyers pre-quarantine certificates as per EU standards for export. In the first go, official sources suggest, three lakh plants will be imported that would suffice the first 1000 kanals of orchards which will emerge as literal demonstration plots. Every 3+ feathered plant is expected to cost Rs 440 and interestingly seventy percent of it would go as insurance, custom clearance, docking, sea freight and inland transportation. But once the nurseries come up in Kashmir, the costs will fall to as low as Rs 200. But that will take a few years, sources said. Interesting part of the story is that Pir Panchal Valley is ideally suited for creating nurseries. The famers, however, will have a difficult time in identifying the varieties they would like to grow because the two European countries are growing various apples with diverse tastes. The major varieties being considered for import are Red Delicious, Gala, Granny Smith and Fuji and their various strands and mutants. Experts suggest that given the market in Indian plains, the people will have to opt for sweet varieties especially the Red Delicious and Granny Smith. If some of them are keen to sell down south, they will have to have certain varieties that grow with green colour. Interestingly, only orchard developing companies will be permitted to enter the market having specialization in all the three activities – the root stock, the trellis and the drip irrigation. Asked why the three specializations are not to be segregated for the three activities, officials said it was aimed at preventing “the passage of the buck” – if one part manger fails, he blames the other and then the buck passes on at the cost of the grower and government. This, they said, is aimed at holding one company responsible for creating a perfect orchard, who will have to take the blame and the credit for the orchard development, time and cost overruns, if any. Government sources said at least three companies have applied for empanelment. One is local; another is local having a partnership with a non-local and third is non-local. Not all of them are having a quarantine facility or specialization in all the three fields required in the orchard. The first year is expected to encourage investment in creation of a series of small demonstration orchards so that the process takes off. By 2020, the idea is expected to generate a market that will see not less than 1000 new start-ups jumping into the pre-harvest horticulture as it will generate massive demand. It is expected to throw up jobs in various spheres of related activity – plant import, nurseries, drip irrigation, trellis manufacturing and maintenance. The agriculture university may require rediscovering some of its streams to face the new market and engineering colleges and IITs will also have to take apple seriously now. Orchard Masscares: Can Government Ensure Adequate Supply Of Certain Basics Quickly?